Have some butter that's been sitting in the fridge for a while, and wondering if it's still good? Or thinking about stocking up on butter while it's on sale, and trying to determine how much you should buy? Here's the scoop on how long butter will keep in the fridge and freezer. According to the USDA, butter (opened or unopened) can be kept in the refrigerator for one to three months. It can also be for up to a year. The taste and texture will change considerably after that point, so aim to only buy as much as you think you can use within a year. For the best results, freeze your butter in the packaging that it came in. That double wrap of wax paper and cardboard will do a good job of protecting the sticks from freezer burn. 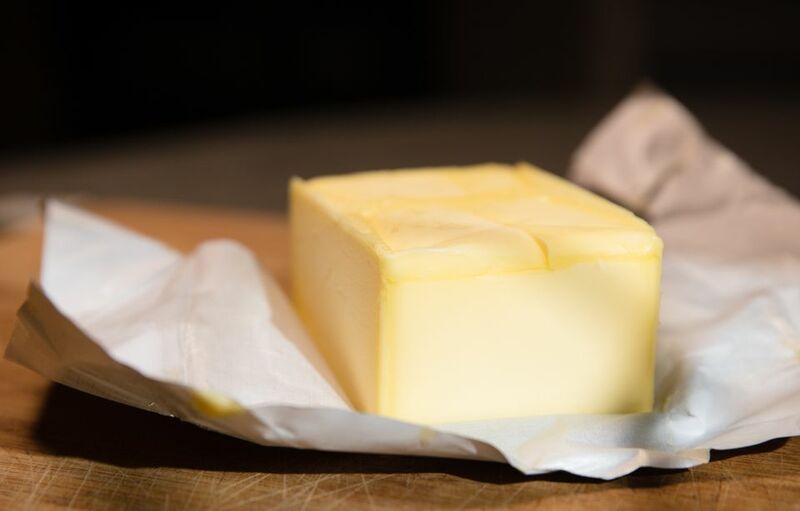 Butter tends to take on the flavor of other foods around it, so be sure to keep it away from and other pungent foods. Onion-y butter might not matter if you're using it in savory dishes, but it won't be a welcome addition to a cake or other sweet treat. Keeping butter in the freezer is almost as convenient as keeping it in the fridge. It can be ready to use in as little as thirty seconds. If you're working on a recipe that calls for melted butter, just pull the quantity that you need from the freezer, and melt it on the stove or in the microwave. Butter burns easily, whether it's frozen or thawed, so be sure to watch it closely while you melt it. If you're working on a recipe that calls for softened butter, place the butter called for in a microwave-safe bowl, and microwave it for 10 seconds at a time, until it softens, but does not melt. I usually flip the butter after every 10-second interval, so it heats evenly on all sides. If you're not in a hurry, stick some of your frozen butter in the fridge, and allow it to thaw overnight. It should be ready to use the next day. Discard any butter that has developed an off-color, flavor or smell. It won't do your recipe any favors and it could make you sick. If your butter needs to be replaced, you can use a until you're able to get to the store for more. Butter has gotten fairly expensive in recent years. If you're looking for a way to save, stock up on butter during the holidays. Grocery stores typically put butter at Thanksgiving, Christmas, and Easter when they know more people will be baking. You can fill your freezer then and have butter all year.